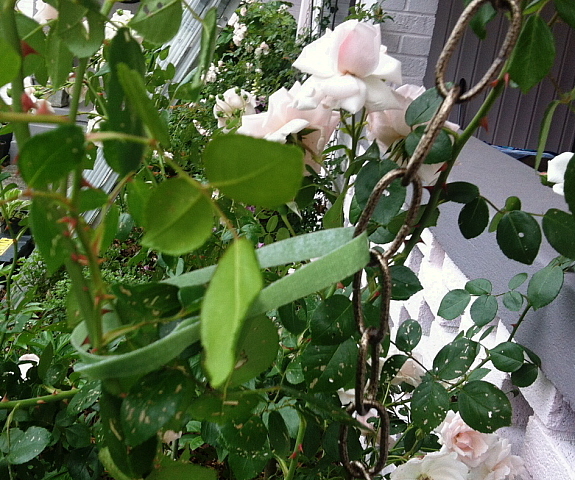 Use Decorative Chain to Support Vines and Climbing Roses on a Wall – Johntheplantman's stories, musings, and gardening. 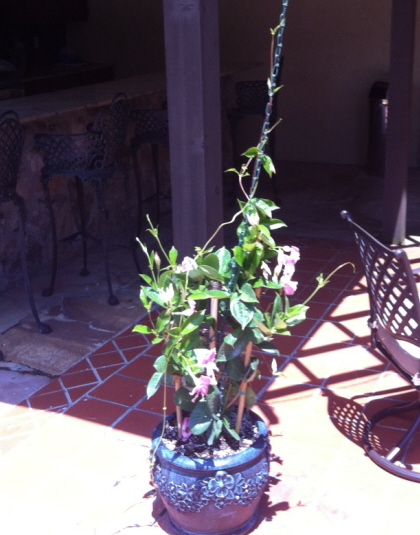 The other day I was planting this year’s mandevilla vine in a pot by a pool for one of my clients. I do this every year and it is amazing to watch how quickly this sweet-smelling vine reaches the top of the pool house. And all it takes is a chain. 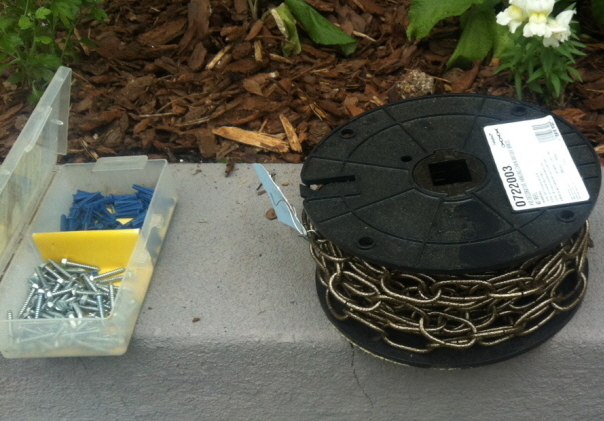 Just what you need–a roll of decorative chain and a wall anchor kit. The roll of chain and the wall anchor kit came from my friendly Ace Hardware store. 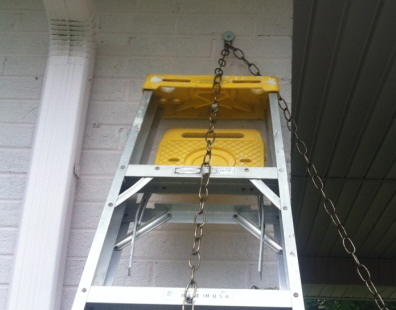 I use the wall anchors a lot, both outside and inside. The anchors are most useful for hanging pictures on inside drywall. The kit comes with a masonry bit for drilling holes in brick mortar joints. 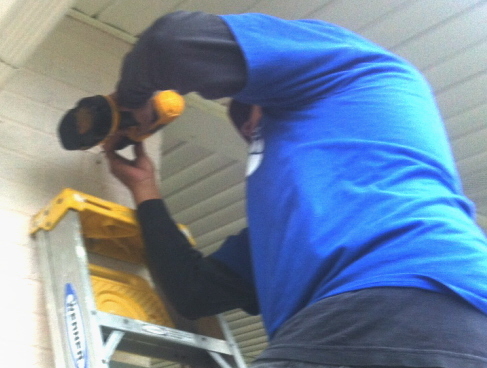 We start the job by drilling holes for the mounting screws. 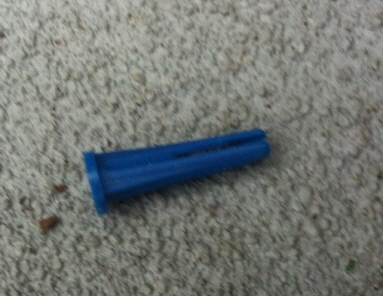 The little thingie shown below is a wall anchor which is inserted into the hole in the mortar joint. You must be sure to use the right sized drill bit. 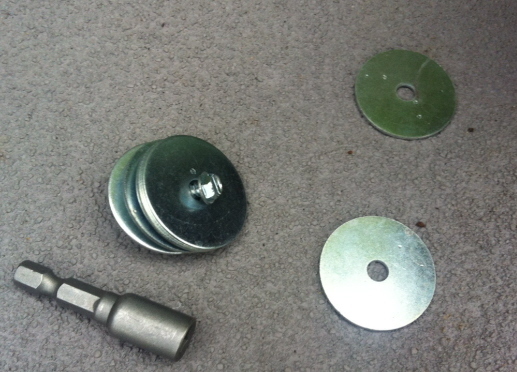 In the picture below, the screw comes with the wall anchor kit and I also bought “fender washers” that are made with the right sized hole for the screw. I have no idea why they are called fender washers. I guess it’s just because that’s their name. The other item in the picture is a driver to put on my DeWalt drill in order to make the screwing easier. 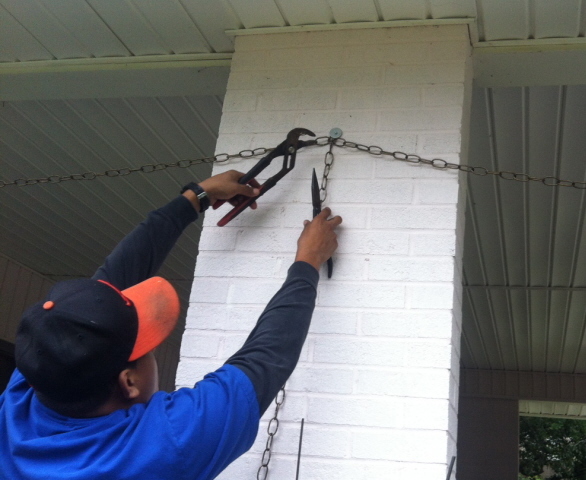 In this installation we will hook the chain to three columns. We leave a small sag in the chain as we hook it to each column. The chain will hang down to the plants on the right and left columns and we will add the center chain last. I was careful to measure and purchase enough chain so that when I got to the right side there would be enough left over to hang down from the center. 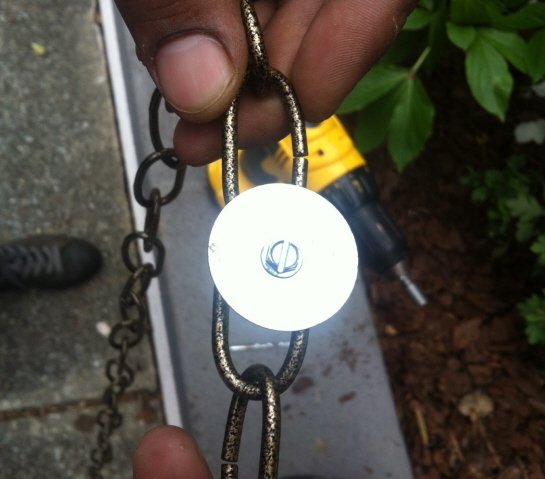 You don’t have to cut this type of chain; it comes apart easily with a couple of pairs of pliers. 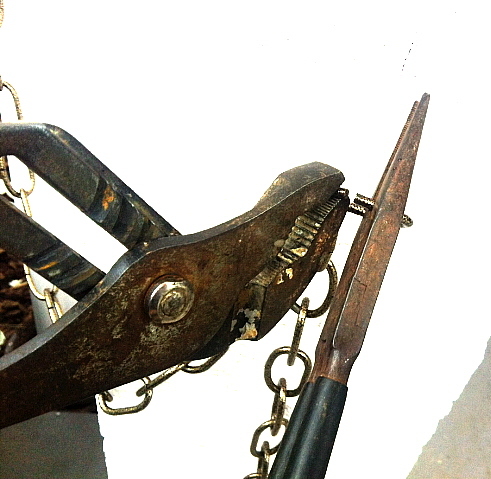 Opening a chain link with two pairs of pliers. The final piece of chain is added to trail down the center column. 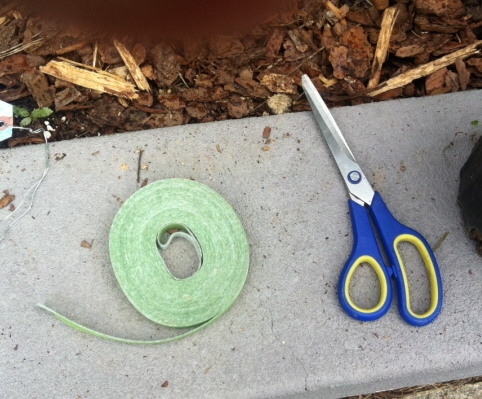 For fastening the plants I like to use a Velcro-backed plant tie material. It is easy to use and I can cut it to size with cheap scissors. 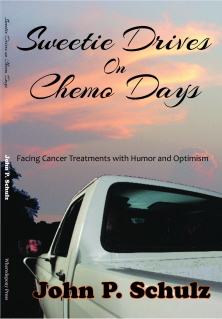 We tie the plant to the chain and everything is set to go. All this project will take now is a bit of tying and pruning. Some plants will twine up the chain on their own. Others need to be tied. If you enjoyed this article, you may wish to visit one of my articles on “Garden Accents.” It’s well worth the looking into. Thanks for visiting Johntheplantman. Tell your friends about it. 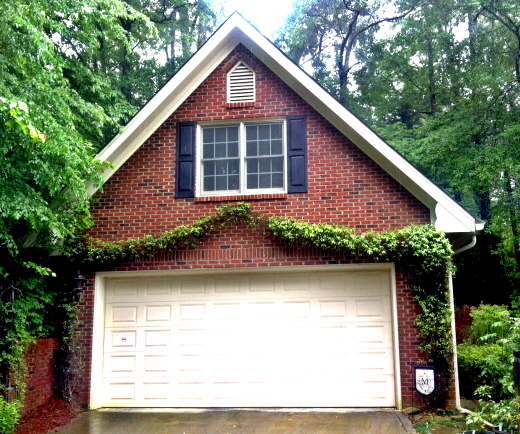 Next to our mailbox post is a Carolina jasmine. For cold weather, we cut it to about half a foot above the soil. Tied to the post (in growing seasons) is a trellis, wider at the top. The vine grows very very fast. By the time it is filled out, it looks like a green Afro (hair) with sweet-smelling white blossoms, I use a similar frame (very small) for my micro-poetry. The small frame gives syllabic tendrils places to wrap (that’s with a “W”).